His paintings sell for around $40 at the Albuquerque BioPark Society's store. This goat in New Mexico is being dubbed "Van Goat" because he can paint, and he's pretty good at it. Bodie, a 4-year-old goat at the ABQ BioPark Botanical Garden in Albuquerque, demonstrated his creativity and artistry in front of an amazed crowd at the Rio Grande Heritage Farm at the back of the garden Sunday. “To see a goat actually hold a paint brush in his mouth and paint and [have] some accuracy with it and some talent, yeah, that’s unique,” ABQ BioPark Zoo Manager Lynn Tupa told ABC News affliate KRQE. Tupa added that painting helps mentally stimulate goats, keeping them "happier and healthier." 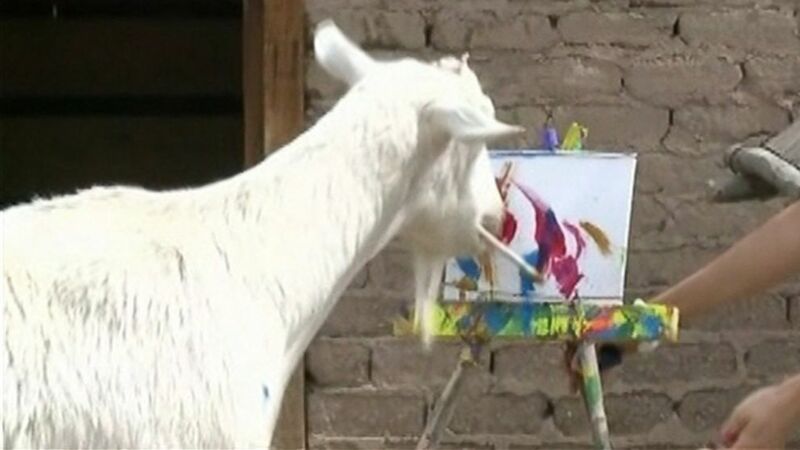 (KRQE) Bodie, a 4-year-old goat from ABQ BioPark in Albuquerque, New Mexico that paints, is pictured here. Bodie can thank BioPark Staff member Kristin Wright for his painting career. She's been teaching him how to paint for the past several months. "He's a fast learner," Wright told ABC News today. "He's faster than I'm ready to teach sometimes." Wright said Bodie's started training last September and he's painted over 30 paintings since then. "He used to be a bit of a pickpocket, he'd take things from people's back pockets and shake his head with the item in his mouth," she said. "That's how I knew he was capable of holding a brush and moving it." Bodie’s paintings are sometimes up for sale at the New Mexico BioPark Society, where you can find artwork created by other animals, such as elephants and alligators, at the ABC BioPark Zoo. Bodie's pieces sell for about $30 to $40, depending on their size.